"I am very pleased with the Sun Ancon Chi Machine. My husband and I have been using it daily with extremely positive results and I have used it with several of my clients for relaxation and centering prior to treatments. Their comments have been enthusiastic and have included calming, relaxing, and centering/grounding." - K. Foster, Reiki Practitioner, Nutritional Consultant, Arborg, Manitoba, Canada. "As a Trager practitioner I do not receive as much body-work as I give, but I find my Chi Machine creates the Trager feeling in my body." - Deborah Hudson M.S.W. - Psychotherapist, Trager Practitioner, Kingston, Ontario, Canada. Perfect for home healing or health care practitioners. "While on my first few minutes on The Chi Machine I immediately enjoyed the vibration that came through my body and into my head. I was particularly conscious of its movement in my stomach area. I felt this must be quite beneficial. In general the last few minutes and after the session ended, I was certain I had my blood moving all over my body. I particularly loved the great sensation when the machine stopped and the final moments of relaxation ran through my body. With little time for exercise at the gym I know this is my answer." - Nora El Gammal, Registered Aromatherapist and Reflexologist - Markham, Ontario, Canada. "I am a Remedial Massage Therapist with certifications in Reiki, Reflexology, and Body Talk. I was introduced to The Chi Machine and knew instantly it was for me. The reason for this is because I have been learning Tai Chi and the response the machine elicited so matched my response to Tai Chi. I am very excited about the effects of this machine on myself and my clients - not only physically but mentally and spiritually." - Rena, Massage Therapist, Reiki Master, Riverton, Manitoba, Canada. "My middle daughter said that The Chi Machine was not for her. After two months of having the machine, she has seen what a difference it made to the rest of the family. She now books in her time also. 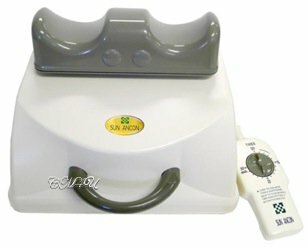 The Sun Ancon Chi Machine has made one huge change in our lives and to the people I have shown, the changes it has made for them in a very short time. We just don't look after our bodies like we should but here is the opportunity to change all that." - Bernard Yonkman, Vermilion, AB Canada. Mobility, energy and strength for a 90yr old. 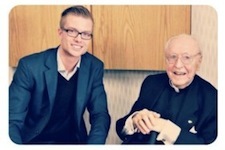 "We've all seen and felt the incredible energy of Reverend Joseph Jegyud who is 90 years old and still able to be present with us all in Lava, Quebec. For anybody who could not attend the meeting, let me tell you that, as a retired anesthesiologist he definitely shines and stands out. He clearly demonstrates his flexibility when he stood up and bent over to touch his feet. We all had a good laugh at this especially since he mentioned that he wouldn't be able to do such things if it wasn't for the HTE devices. "My Spiritual Life Coach bought a Sun Ancon Chi Machine and I had the privilege of trying it. It relaxed me so much that I had a huge emotional release from anger inside that had resulted from childhood. I easily fatigued, especially on humid days. Recently, when we had a humid day, I used the Chi Machine and I was revitalized and got my energy back. My 73 year old mother has pain as she grows older. She has tried The Chi Machine for 5 minutes 3 times now and she has noticed a shift. She is able to sit longer and her flexibility has improved." - Healing Touch Practitioner, Ontario, Canada - Angela Niedling CHTP. "We have incorporated The Chi Machine along with the Hothouse Dome in our clinic and are having tremendous results with regards to pain relief, ordinary weight loss, and overall health. We find that the use of The Chi Machine and the Dome, prior to working with a client, enhances the process itself. These marvelous tools have enabled us to assist numerous people in their quest for health." 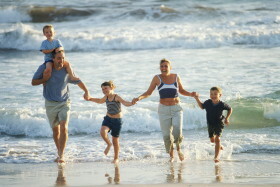 - Detox Clinic, Nepean, Ontario, Canada - Thoriams Primary Health Care Clinic. Physical, Mental and Emotional Therapy. "I use the Total Health Spa daily for physical aches and pains as well as mental and emotional healing and calm. It provides a wonderful meditative safe space for spiritual contemplation." - Maureane Dupuis, Registered Reflexologist, Edmonton, Alberta, Canada. 70% of Canadians prefer natural healing products. Take a look at these holistic healing machines which work with the natural healing energies of the body. No drugs, no invasive procedures, no toxic side effects. This website is for informational and educational purposes and is not intended to provide individual medical advice which should be obtained from a qualified health practitioner. Chi Machine International does not claim that any HTE product presented herein will diagnose, treat, cure, mitigate or prevent any disease. Ask questions. Research everything.